We’ve written about Maui artist Dale Zarrella in this blog before. (See Maui Artist Dale Zarrella at Work, Frank Lloyd Wright and the King Kamehameha Golf Club, and Dale Zarrella and Helper Create a Vision in Sand.) 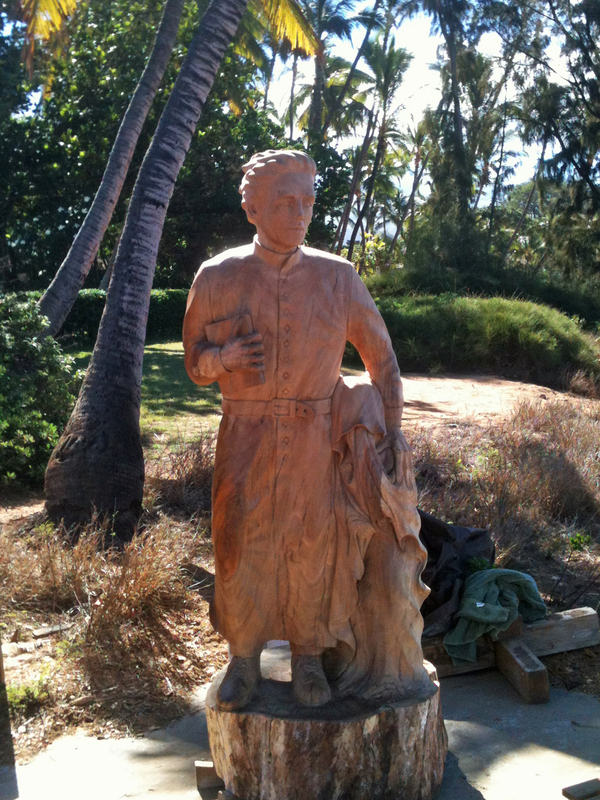 His koa wood sculpture of Father (now Saint) Damien is entering the polishing phase. Saint Damien, “the Apostle of the Lepers” was canonized in 2009 for his work in the 19th century caring for those quarantined in the leper colony on the peninsula of Kaluapapa on the Island of Moloka’i. If you look closely at the picture below, Damien has his hand on the shoulder of a young child. Next to Damien’s shoes you can see the child’s toes sticking out beneath the robes that hide his leprosy ravaged body. As we’ve noted before, Zarrella works outdoors overlooking the sea at the north end of Charley Young Beach. He began this piece with a plaster study, about one-quarter life size. A bronze cast from the study now resides in the Vatican Museum in Rome. This life sized sculpture is destined for the Damien Museum in Honolulu.